Description: MEC 608 - MEC 619 - MEC 606 lead a short POED at the Scarborough Marsh on the evening before Thanksgiving. Title: EDPO 608 at Winnock's Neck Rd. Description: MEC 608 - MEC 517 - MEC 617 lead a rare (for this area) daytime EDPO east through Winnock's Neck Rd. in Scarborough ME. Most of this train was made up of spine cars with Eimskip containers for the new Poland Springs water service. 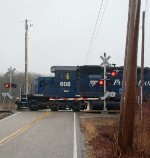 It sure is nice to see intermodal trains in Maine again! Description: POED's power sits at Rigby Yard. Description: This nice lashup of MEC 608 and MEC 614 will go out on POED a few hours later. Description: ED4 brings POEDs power towards the pit at 1216. Description: Built July 1972 as MILW 3040. Description: The MBTA work train has arrived at Lawrence yard to interchange coaches headed west for rebuilding with Pan Am LA-1. Description: POWA with MEC 608 - MEC 517 - MEC 601 - MEC 313 arrives at Waterville Yard. Description: PO-2's crew uses MEC 608 - MEC 7545 to move a cut of cars to another track at Rigby Yard.